Bolt the Gear Up Off the Wall 1 Bike Vertical Rack to a wall. 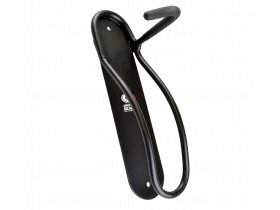 You can now hang your bike by its wheel to the rack's hook. The bike now hangs vertically off the wall. Simply roll the back wheel into this grand stand and it will support your bike as surely as a toast rack will support a slice of grilled bread. Accommodates any width of tyre from 21mm-wide road to 2.25 inch MTB size. 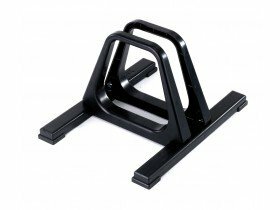 The Off-the-Wall Grandstand Floor Stand is equally suitable for road bike, mountain bike or any bike in between. 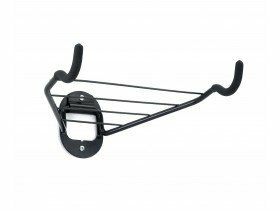 This simple rack allows you to store one bike off the wall (and off the ground) with its top tube resting on the rack's arms. When not in use, this rack's arms fold down and out of the way.